The main flow of the North American wood warbler migration has passed me by again and I have had to visit the far reaches of the globe to get my share of the colours of May. 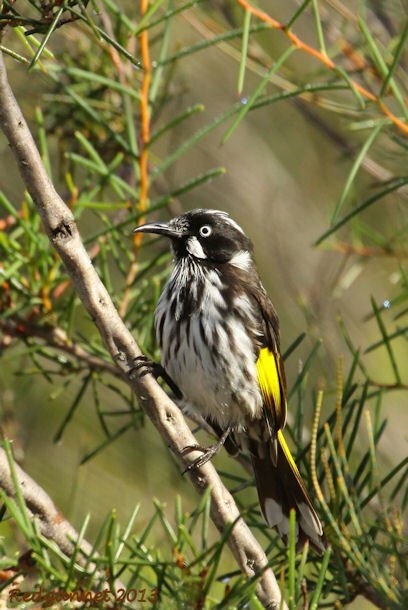 The New Holland Honeyeater, Phylidonyris novaehollandiae, is a sedentary bird so can be seen in its black, white and yellow, year round within its range. The nominate, was described from southeastern Australia. P.n. longirostris is from the southwest and P.n canescens may be seen on Tasmania. A couple of Island races exist on Kangaroo Is. and in the Bass Strait. 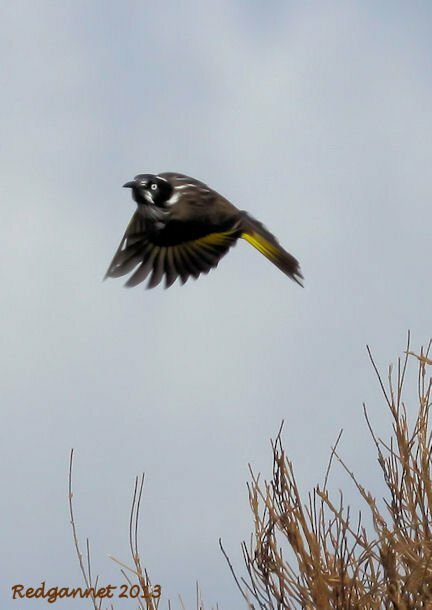 The photos in this post are of the nominate form, from Royal National Park near Sydney. 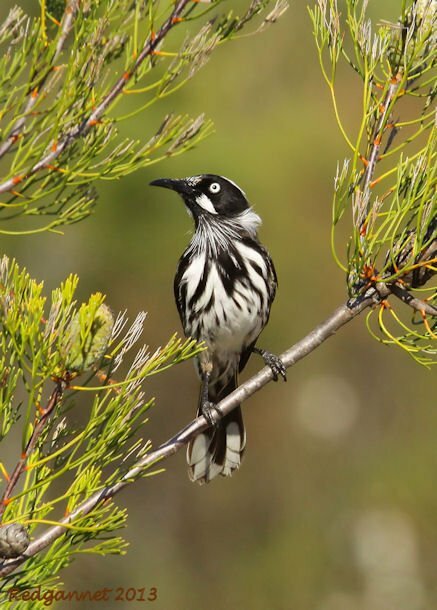 Honeyeaters are an Papuo/Australasian specialty with only one species crossing the Wallace Line west, to Bali. Along with Australian Chats, Wattlebirds, Myzomelas, Friarbirds, etc, they make up 178 species in the family Meliphagidae. It will come as no surprise to find that they live primarily on nectar, collecting it from flower blossoms with long brush-tipped tongues, but they will also take insects, especially to boost their protein intake for breeding. 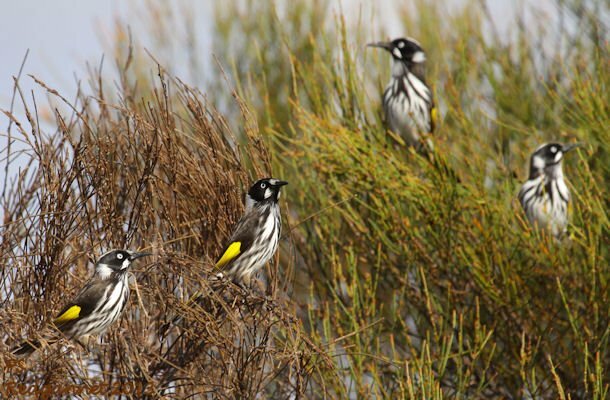 Though they are described as sedentary, the New Holland Honeyeater does have abundance spikes coinciding with favourable local conditions. Their numbers south of Sydney this week were much higher than I have previously experienced with big numbers seen along the heathy, Uloola Trail in Royal National Park. They were wary in the early morning, but became more approachable as the day went on. As flower visitors they have an important role as pollinators for many of the native Australian flora, but need to supplement their diet with some protein. To this end, they adorn the tops of heathy bushes in small flocks and hawk for insects. Their hawking flight was very erratic and difficult to capture. This photo was caught by focussing on one bird and waiting until it launched itself. If you enjoyed this post and would like to see more great images of birds, go to our 10,000 Clicks section where you will find our big (and growing) gallery page here at 10,000 Birds. Great photos of a very beautiful bird! I was in Sydney a few years ago, and wish I’d seen this bird. Always an easy one to get in Sydney on the coast, this to me is the bird of coastal heath. Where Are You Birding This Second Weekend of June 2013?